Wednesday, July 11, 2012: – HomeAdditionPlus.com announced today the availability of its free online “Home Sale profit Calculator”. The “Home Sale Profit Calculator” is ideal for both real estate professionals and home sellers for instantly calculating net profits based upon a buyer’s offer. With the “Home Sale Profit Calculator” tool a seller or real estate agent can simply type in the buyer’s offer, along with the real estate commission rate, state transfer tax rate, and legal fees, to calculate the net proceeds from the sale of the home. In addition, the “Home Sale Profit Calculator” also has the ability to allow sellers and real estate agents to enter in the original cost basis of the home (what the seller previously paid for and invested in the home), and his or hers federal tax bracket rate to determine the after tax net profit on the sale of a home. There are many online home buying tools on the market today that allow prospective home buyers and real estate agents to quickly determine monthly mortgage and insurance costs based upon listed and hypothetical home sale prices. However, there is little available for helping home sellers assess buyer offers. As a result, home sellers are often disappointed and financially shocked when they find out at the closing what their net proceeds are. Moreover, if they sold their home for a financial gain, and they are not investing the proceeds into a home of equal or higher value, they are further shocked by what they owe the government in capital gain taxes. This particular situation is a very common problem with vacation home sales. The “Home Sale Profit Calculator” addresses these issues and concerns by allowing the home seller to quickly determine their net home sales profits and their tax liability, including state transfer taxes and federal taxes associated with their home sale. 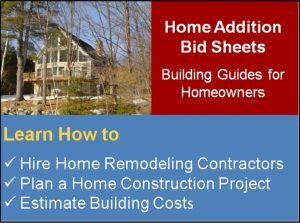 “The “Home Sale Profit Calculator” is an invaluable tool for home sellers” said Mark Donovan CEO of DIY HomeAdditionPlus.com. “Even though the real estate agent represents the seller when selling a home, the final sales deal often ends up simply being a quick conversation between the seller and his or hers agent on what’s the seller’s rock bottom price is, relative to a buyer’s offer. The total selling costs are often glossed over during this conversation and frequently the seller is disappointed when they find out later what their net home sales proceeds are. The “Home Sale Profit Calculator” is a free online tool available on HomeAdditionPlus.com at “Home Sale Profit Calculator“. The “Home Sale Profit Calculator” can also be licensed for a nominal fee so that it can be integrated and used on other websites or services.